Original frontispiece illustration by Joanna Ebenstein and G. F. Newland. 138 pp. Oblong 6-1/2 x 9-1/2 inches. Twenty-two numbered copies specially bound by hand for subscribers and signed by the author and artists (details upon request). Trade issue : hardcover, full brillianta cloth binding with printed dust jacket. ISBN 978-0-9764660-7-9 $22.50 (post free in U.S.; overseas add $17.00 overseas). Trade discount available. MY MAN AND OTHER CRITICAL FICTIONS is an original collection of 8 critical fictions on Joseph Conrad’s Nostromo, King Lear, Olaudah Equiano, Harry Mathews, and other writers and texts. The critical fiction is a literary mode that takes as its subject another literary work and treats of that work’s construction, obsessions, and sources in narrative and poetic, rather than expository/critical terms. 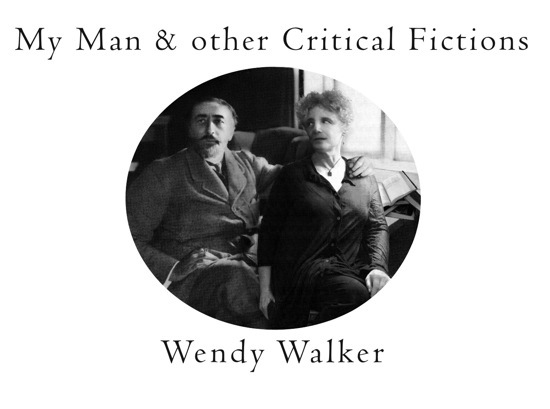 Wendy Walker is one of the chief proponents of the critical fiction today ; some of her predecessors include Jean Rhys, Jorge Luis Borges, Angela Carter, and Guy Davenport. Wendy Walker is author of a modern masterpiece, The Secret Service (1992) ; a work of poetic non-fiction, Blue Fire (Proteotypes, 2009), exploring the case of Constance Kent ; and two collections of short fiction, The Sea-Rabbit, or, The Artist of Life (1988) and Stories out of Omarie (1995). Her website is wendywalker.com. To celebrate publication of MY MAN & OTHER CRITICAL FICTIONS, Temporary Culture is pleased to convene a Critical Fiction Symposium on Tuesday 25 October 2011 at the Grolier Club in New York City. Participants will include Wendy Walker, Ron Janssen, Jennifer Nelson, John Crowley, and Henry Wessells. Details on the Symposium page. « criticalfiction.net » is published by Temporary Culture, P.O. Box 43072, Upper Montclair, NJ 07043.
criticalfiction.net © 2011 All Rights Reserved.